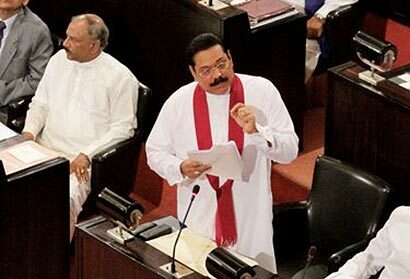 Referring to the passing of a motion of no-confidence against him and the government at parliament yesterday, which was taken by voice vote, Rajapaksa said that such important votes cannot be taken by voice. He stated that the Prime Minister is appointed by the President and not the Speaker. “Don’t misunderstand your powers,” he said pointing to the Speaker. “Parliament has not given you those powers.” He also accused the Karu Jayasuriya of misusing powers of the Speaker. “We are expecting an independent speaker not a biased speaker,” he said. The Prime Minister expressed his regret that the Speaker is acting for his “party and friends abroad”. Rajapaksa expressed his gratitude to the JVP for stating yesterday that they would support a motion to dissolve parliament and go for polls. “What is UNP’s stance?” he questioned. “We want an election. A general election,” he emphasized.